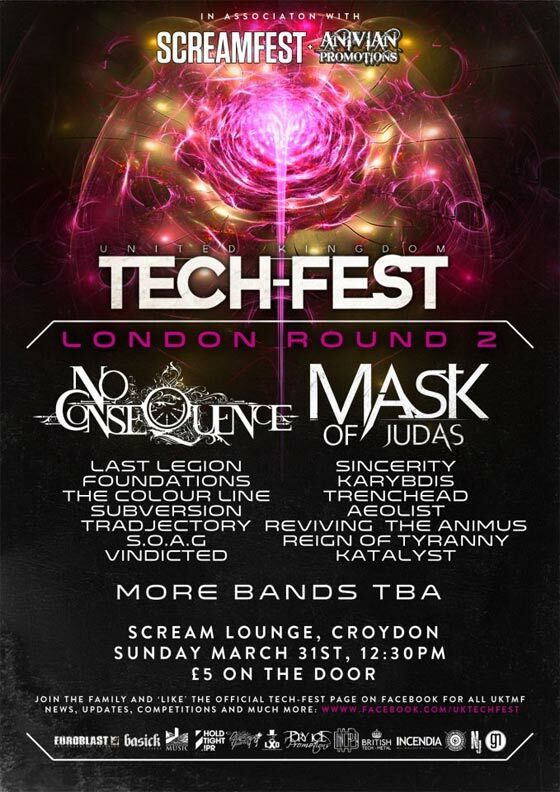 UK Tech-Metal Fest is continuing to expand rapidly as they have added yet another event to their ever growing line of concerts. That’s right, there will be a second London event held by the Tech Metal aficionados and it’s looking as good as ever. It will take place March 31st at the Scream Lounge and will feature a multitude of bands. The headliners will be No Consequence and Mask of Judas. Supporting acts include Last Legion, Sincerity, Foundations, and Karybdis among many others. Check out the flyer along with music from the bands down below and get ready for the solid ton of metal headed your way!